The sun hasn’t been very strong yet and I suspect that there’s frost still making its way out of the ground in the woods. So the wildflowers are taking their time. 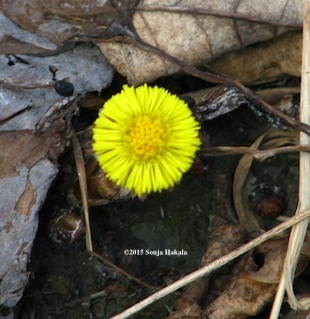 But hunkering down amid the leaf litter are the brave little flowers of coltsfoot. And the honeysuckle is starting to leaf, the stems of the river willows are greening up, and there are robins everywhere. Must be late April in Vermont! This time of year, we are reminded how much we depend on the bounty of trees for the beauty of Vermont. Everywhere we walk in the woods, careful to avoid the places that are still wet, last year’s leaves cover the ground. Curled and brittle, our shoes help compost them, making them part of the soil that nurtures the plants we’ll enjoy from now to when the leaves come back down again. 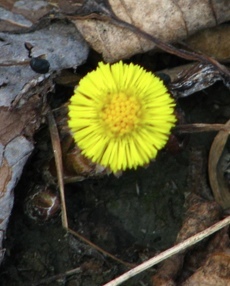 The tiny, sunshine faces of coltsfoot are among the very first plants to appear on the forest floor. At this time of year, they don’t bear any chlorophyll producing leaves, preferring (for their own ancient reasons) to turn their blossoms to the sun, now unblocked by a canopy. 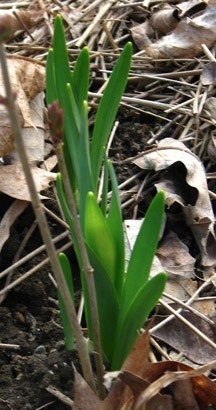 The same holds true for our gardens as the snowdrops then the iris reticulata and now the daffodils jockey for their share of the growing warmth before the larger plants take over. We’ve all been remarking how strange a spring it’s been so far, especially after such a deep, frigid, everlasting winter. We didn’t have anything even close to an ice out on the river. We had a melt instead. The dirt road reports indicate that the tire-sucking mud we usually get did not transpire. Though the frost heaves have been remarkable. Our protests to the contrary, we humans don’t care for change that much, at least not sudden change. But suddenly, “our weather” seems less like our own than usual. Which makes the coltsfoot and daffodils just that much more welcome.